What is Storax mobile racking? STORAX Mobile Racking is a high-density, electrically-operated storage system that can accommodate both conventional and unconventional racking. Appropriate for new and retrofitted ambient and cold-storage applications, STORAX maximises usable space by removing the need for multiple aisles, increasing vertical capacity, and providing 100% access to each and every pallet position. How does STORAX Mobile Racking work? The STORAX Mobile Racking superstructure runs on electrically-powered bases that travel along rails embedded into your warehouse’s concrete floor. Each mobile unit stacks side by side (according to an optimal layout created for your space) and is accessed by shifting the surrounding units to create aisle space when and where it is needed. STORAX Mobile Racks can be controlled using on-base pushbuttons or via a remote control. This is ideal for fork lift operators who can open new aisles without leaving their vehicles. Lighting can be controlled to illuminate only the open aisle, resulting in significant energy savings. All STORAX Mobile Racking systems installed by Barpro Storage conform to European health and safety standards, and use the highest-quality steel and manufacturing techniques to ensure maximum longevity. There are STORAX installations in South Africa (overseen by Barpro Storage) that are still operational after more than 20 years. Ask about our SLA to maximise the lifespan of your system. 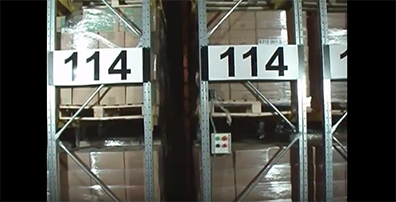 Take a look at STORAX in action to see how mobile racking can transform your warehouse. View our range of complementary products for ambient and cold storage environment.